Bestselling author Wanda E. Brunstetter delivers a poignant historical story of a couple on the threshold of marriage who are suddenly pulled apart. Elizabeth Canning discovers an awful secret in her deceased mother’s diary. Believing her chances for a happy marriage are spoiled, she leaves her fiance a letter and flees town. Anticipating a Christmas Eve wedding with Elizabeth, David Stinner is confused by her letter and desperate to find her. Can David root out the truth about the past and bring back his bride? Or is the truth destined to bring an ultimate end to their romance? 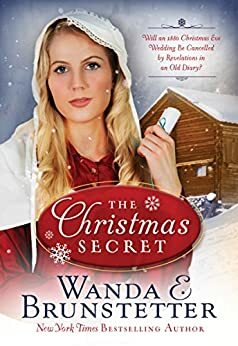 The cover of The Christmas Secret was so beautiful. Then I smiled when I opened up and seen that every page was decorated with pine boughs at the bottom (this may not be true with the ebook). It helped sit the stage for such a short, sweet, suspenseful story. The setting was described perfectly that I could imagine the cabins, and the surrounding areas. The secret had just the right amount of suspense that I wonder at times how it would turn out. I could also feel the hurt of a love that could not be. This story was short but sometimes that's exactly what I need when I don't have a lot of time. With that said I wish that we knew a little more about the some of the characters. I feel as though people just dropped in at times. All nice people but I would love to get to know them just a bit more. I love it when there are recipes at the back of the book and there were a couple in this book. They sound so good I just might have to try them!